The NuVasive Spine Foundation™(NSF) recently supported a surgical mission trip to Karl Heusner Memorial Hospital in Belize City, Belize. During the seven day mission trip, the Belize Spine Program completed a total of five life-changing surgeries. The patients included three juveniles with scoliosis and two adults. 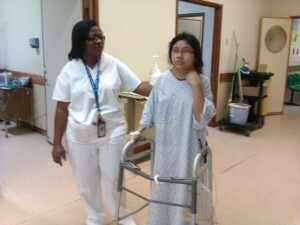 Kastanea Cruz walks on the second day after receiving a T3-L3 fusion at Karl Heusner Memoral Hospital. The surgeon team included: Dr. John Williams, Dr. Andrew Moulton, Dr. Joel Cervantes, Dr. Pedro Nuez, Dr. Dominic Cervantes, Dr. Delfonso Roberts, Dr. Walter Perez, and IMI Neurophysiologist Matt Robinson. A unique patient, 14-year-old Kastanea Cruz, was diagnosed with scoliosis in the thoracic and lumbar regions of the spine at a young age. After receiving a T3-L3 fusion, Kastanea’s father asked to share his daughter’s gratitude for her life-changing surgery with NuVasive® Shareowners. “On behalf of Kastanea and my entire family, please accept and extend my most heartfelt gratitude to all of the team that made Kastanea’s surgery possible. Your work, commitment, and dedication are extremely admirable. May God continue to bless you.